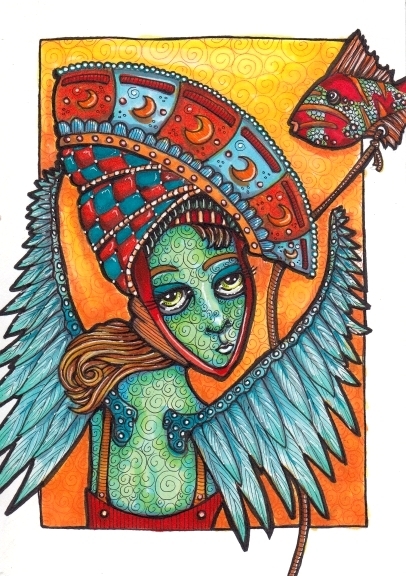 Hat Fairy With Fish and a Cephalopod Wrangler. The second and final secret package has landed. Including this hat fairy. I almost kept it! I really like the design of this. And the hat. Might have to put her on a greeting card or something. Hello Paint Party Friday! Progress pics below. Thanks for stopping in! 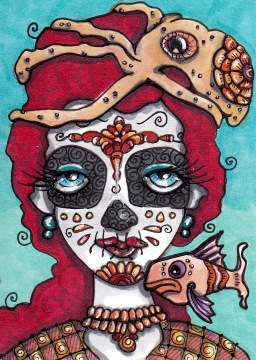 This entry was posted in ATCs and ACEOs, Copic Markers, Elaborate Costume, Paint Party Friday, Progression Photos and tagged aceo, atc, Copic Markers, maidens, pen & ink on June 5, 2014 by The Beast Tender. Great designs. Have a nice weekend, Cindy! Very detailed and precise work and great final effect. Thank you for sharing! Love her wing breasts and overalls. Your work is so intricate and compelling. Actually I see her both ways and she is fabulous…it was my attempt to be funny. Seems like the plural should be octopie. I’ve been trying to decide how to answer this comment all day, but I doubt you’ll be back! I thought I might mention that this is an art blog, for sharing art! In any case, the word you are looking for is “octopi” and while it is acceptable because it’s been in common usage for so long, the more correct form is actually octopuses. As mentioned above. Here is what I found, when I looked it up. Oh my goodness, I picture you having so much fun, giggling as you create these outrageously creative hats and creatures! The colors and patterns — I love the way you play! Super awesome Ganesha. And I love the little gnome dwellings! Adorable! Hi Cindy..wowness..your work is visually thrilling and so wildly beautiful to gaze at…mesmerizing!! Love the wild sea life hanging on here. Oh my goodness, they are both incredible! I so love the skin of the first one, she is amazing!! It has been a while since I’ve seen your art too, I am so glad to have seen it today! What beautiful colours and patterns you put into your very unique paintings. I love, love, love the Wrangler-I think it’s the jaunty octopus she’s sporting as a hat. Wow! You have such magical, creative, detailed work! Truly wonderful! Happy PPF! So creative – love the details and colors! Cindy, I love the colors on the top illustration. The subtle change in tone in the background works well. The blues, blue greens, reds and yellows work very well as a color palette. Great job. The Cephalopod Wrangler (Octopus girl) looks good, I just like the top illustration more. Cindy…..this is gorgeous! The details and colors and fabulous! Her eyes almost sparkle…..this should definitely go on a card or something……great work! That top one, Cindy? Wow! The color beckons the viewer right in! I love the shapes and composition of it all! These look fabulous! Thanks for sharing your process pics too, so great to see how they develop. I’ve never used copics, but they look like fun. Cindy, your Hat Fairy transcends into all sorts of artsy territory! There is so much there as an illustration, fine art, any way one wants to describe it. Absolutely gorgeous!